A review of Secret Identity Rosé 2016 for Weekend Wine Reviews #342. 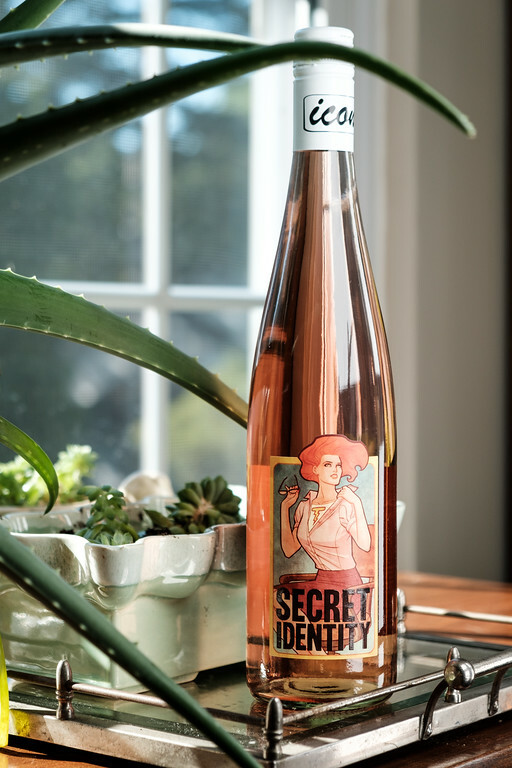 Secret Identity Rosé 2016, Iconic Wine, Wine Awesomeness. Wine Awesomeness says: This wine is from Lodi, California. On the nose – peonies and pink fruit like grapefruit, strawberries and raspberries with just a pinch of salt. On the palate – full, curvaceous body that is jammy with blooming cherry blossoms and macerated raspberries. This dry rosé contains a secret blend that achieves peak balance in all it’s flavors. It is crisp, clean and low in ABV. Iconic Wine says: an ideal summer rosé. At about 10% alcohol, it makes the perfect wine for a day at the beach or a picnic! It is aromatic, fresh and readily drinkable. We say: A perfect balance of sweet and tart. Very light and refreshing! A new favorite back porch wine! This would be perfect for our Rosé Sangria! We havhave not had a Rose in a while. This hot weather practically demands it! Rather a nice label too.